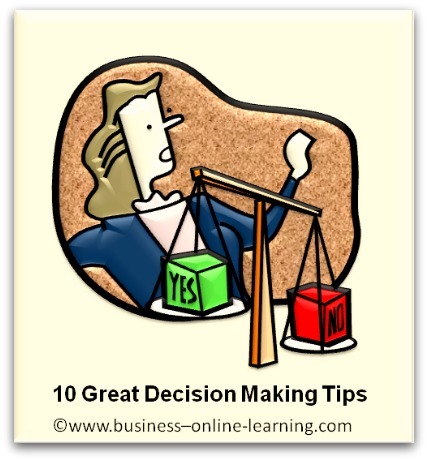 The following 10 easy and quick decision making tips are ones I have gathered over the years. I have put them together for your use. 1.Force yourself to make decisions faster. Use the categorisation Important -> Unimportant, Urgent -> Not Urgent to categorize the matter and decide quickly. 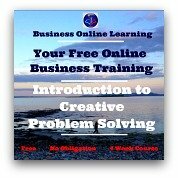 Clear away minor topics quickly so you can focus and dedicate most time to topics that are Urgent and Important. 2. Avoid Procrastination. Use the quote from the Six Sigma Approach “Just Do It!”. Get started and finish what you have started. 3. Expect the unexpected. Remember the saying “Having no plan B means having no plan”. 4. Think before you act. Use short delaying tactics like counting to 10 before you respond to difficult questions. Then determine your answer according the goal you have in mind. 5. Be care of assuming facts. We will often jump to conclusions and forget to check the facts! 6. Learn from history! Build on past decisions that were good. Learn from the past; what lessons have you learned? 7. Be systematic in your approach. By this I mean developing and following a good routine when you have to make a decision. Start with the goal you want to achieve. Evaluate the possible actions against that goal; what are the risks of your actions being helpful in reaching that goal or not. 8. Talk your ideas through with a wise person. When faced with having to make a major decision bounce your ideas off a well-informed person or group. Listen to their arguments against and for your choice and this will prepare you well. 9. Leave yourself enough time to think things through. This means avoiding knee-jerk reactions to situations. 10. Always consider the potential consequences. Are you prepared to “carry the can” for the consequences of your decisions as well? Start with the end in mind and work out your steps needed to achieve your goal. Have you any decision making tips you would include with the above? Ones that are your own favorite approach? Would you like to share them with our readers in the comments box below?